Firstly we are ecstatic to be able to welcome you on board and hope that you find answers to any questions you may have in here, however if you do not please ring our support line (01865 589994) or alternatively email support@nexuswebsites.co.uk. 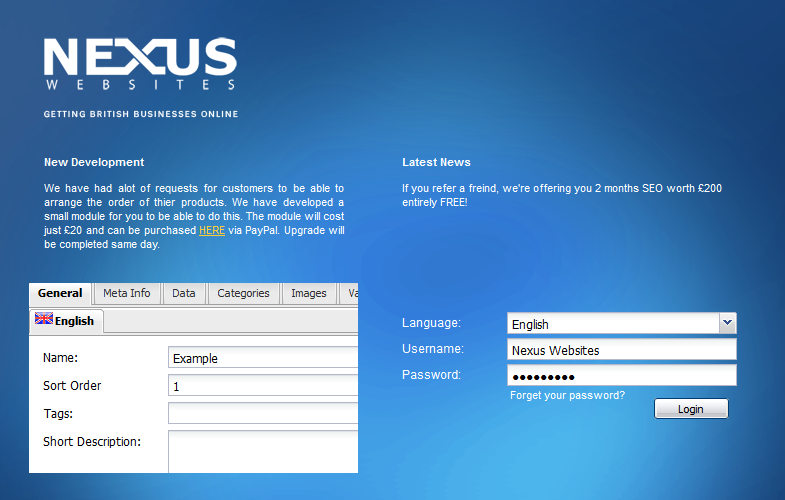 The shopping cart software we use is a new generation of eCommerce solutions with large develops made by Nexus Websites. The greatest part of the platform is we can do with it what we please; there are no limitations as far as we are concerned! Compared to other shopping carts, the platform we use is unprecedentedly easy to use. This guide demonstrates how to build an effective online store step by step using this software. When the website has been completed and signed off, we will send you details reference your control panel login details (please keep this information safe and on record). To login you will need to be using a supported browser (please note Safari and Google Chrome are not supported currently). To get to the page to login it will be www.yourwebsite.co.uk/admin. Access your website anywhere, it couldn’t be easier! You will find various icons throughout your control panel. Here is a small useful guide to understand what each button is, and what they will do. Delete is not reversible! So be careful!